The exotic island of Zanzibar is located about 25 miles from the Tanzanian coast, and 6° south of the equator. White sandy beaches line the shores, fringed by wispy palm trees that sway gently in the breeze that comes off the Indian Ocean. The crystal clear, warm turquoise waters entice snorkellers and divers to explore never-ending coral reefs. 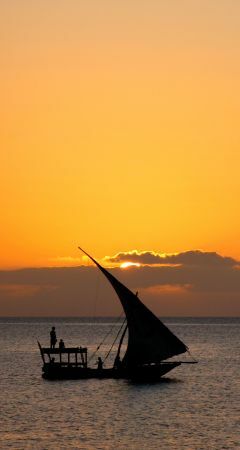 Romantic dhows cruise into the golden sunsets. Zanzibar is a relatively small island, only 60 miles long and 20 miles wide, and is home to 800,000 inhabitants. The island (also known locally as Unguja) is actually part of a small archipelago, which is made up of Zanzibar and a number of other islands, which include Pemba and Mafia. The local people speak Swahili, and they have a wonderful mix of ethnic backgrounds - which is encapsulated in the vibe that you feel from the moment you step onto the island. The capital of the island is the historic and ancient Stone Town, which has a maze of winding narrow alleys, mosques and grand Arab houses, and bustling bazaars selling everything from silk to spices. Step into Stone Town, and you may think you have stepped back 200 years. Nothing has changed in this ancient city since then. Traders haggle noisily in the busy bazaars, spice smells linger in the air, and the winding streets and alleys weave their way past old stone buildings with elaborately carved, brass-studded wooden doors. At sunset, the mosques ring out with the sounds of prayer, and market food stalls set up around the harbour area. It is a great place to just wander around and absorb the atmosphere of a town that time has almost bypassed - even if the tourists haven't. There are more than 25 tropical beaches on Zanzibar. Some are busy, others so peaceful you will have the white sands all to yourself. Either way, they are the perfect place to relax for a few days and soak up the African sun, either at the beginning or end of your trip to Tanzania. Some of the best beaches are located on the north and east coasts of the island. The diving off the coast of Zanzibar is outstanding. Beginners and experienced scuba divers will delight in the colourful coral reefs that surround both Zanziba and Pemba, and good visibility and year round warm water temperatures make the experience even more enjoyable! Barracuda, kingfish, tuna and wahoo swim alongside playful dolphins, graceful manta rays and sharks. Tropical fish favour the shallower waters, making this also ideal for snorkelling. Below you will see just a small selection of hotels in Zanzibar that we work with to give you some idea of prices, but if you want a quote for somewhere else, please let us know! In every room you will find a comfortable queensize bed with a large mosquito net, and a private bathroom with shower and toilet. The rooms do not have air-conditioning, as they were designed to use the ocean breeze to cool down the rooms. In every en-suite room you find a comfortable queensize bed with large mosquito net, a ceiling fan, a safe deposit box, and a spacious balcony or veranda. There are 15 Sunshine Suites, 4 Blue Wave Suites, 2 Blue Breeze Suites and 2 Panorama Suites, giving guests a range of options to choose from depending on their budget. The 31 rooms and suites have fabulous interiors with either a double or king-size bed and breathtaking views of the ocean or gardens. The balconies are perfect for one to enjoy a morning coffee or a nice drink at sunset. Guests staying at the Sultan Sands Island Resort have a choice of 76 en-suite rooms built in single storey African style rondavels - each with 2 tastefully decorated rooms with a separate changing room leading into the superbly appointed en-suite bathroom. Each room has either a verandah or balcony. The Superior Rooms are located on rising ground overlooking verdant gardens. The Junior Suites are located in a private wing of the resort, so are extremely private and exclusive. The guest rooms are beautiful and romantic, each representing Zanzibari traditions in a distinct way. Ceiling fans keep guests cool along with the constant breeze on the upper floors.